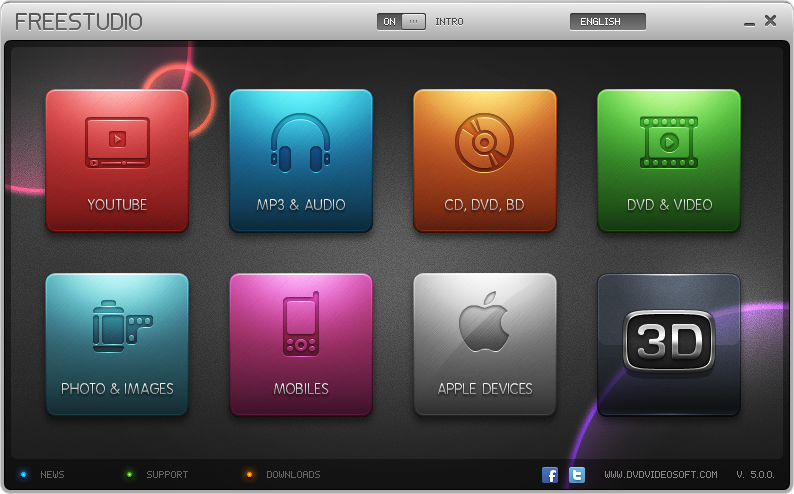 Free Studio is a single bundle of all DVDVideoSoft's free DVD, video and audio software. This could easily have become a chaotic mess, with for instance Free Studio adding 25 new icons to your desktop - but fortunately it's much better than that. All you'll actually see is a single new Free Studio icon. Click this and it will launch a front end menu for the suite, which neatly divides the programs into four sections (Internet, DVD & Video, MP3 & Audio, CD/ DVD/ BD). Choose one of these and you'll see links to the individual programs, which you can then launch and try out. The programs themselves are very easy to use. The Free Audio CD Burner, say, has a browse button to let you select music files, and a Burn button to create the disc: you'll know how to use it right away. But there are still plenty of useful and more powerful utilities here, particularly in the excellent video conversion tools (you'll be able to convert videos to iPod formats with ease), and if you're at all interested in this kind of program then Free Studio really is an essential installation. I'm really impressed with this program, it's free, easy to use and it has tutorials! Keep it up! Hi Donald, we've just checked and it's definitely a 5.3.5 build? It's like the Swiss Army Knife of Audio/Video tools. Excellent Tool with everything with-in reach of a click or two, nice. WhatsApp Messenger is the world's most popular instant messaging app for smartphones. You can use it to send and receive text and voice messages, photos, videos, even call your friends in other countries, and because it uses your phone's internet connection it might not cost you anything at all (depending on whether you'll pay data charges). It's easy to set up and use. There's no need to create and remember new account names or pins because it works with your phone number, and uses your regular address book to find and connect you with friends who use WhatsApp already. You can talk one-to-one or in group chats, and because you're always logged in there's no way to miss messages. Even if your phone is turned off, WhatsApp will save your messages and display them as soon as you're back online. There's plenty more (location sharing, contact exchange, message broadcasting) and the app is free for a year, currently $0.99/ year afterwards. • Adding contacts using WhatsApp is now easier. You can enter a phone number and check if it's on WhatsApp before saving it. Tap "New Chat" > "New Contact" to get started. Unfortunately, the download link doesn't seem to work at the moment. You may	try again in a few minutes or	contact us to report the problem. © 2009-2019 nextmedia Pty Ltd.